This is a 2018 Berkshire, 23′ Berkshire Pontoon with Mercury 150HP Four Stroke Motor. 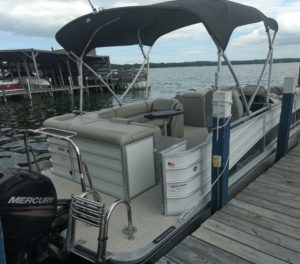 This pontoon has Pearl White/Charcoal exterior, 25″ Tubes, a Depth/Fish Finder, Tow Bar and More! Upgrades include 3.0 performance package, Pearl Gray woven vinyl floor and upgraded captains chair with bolster seat!